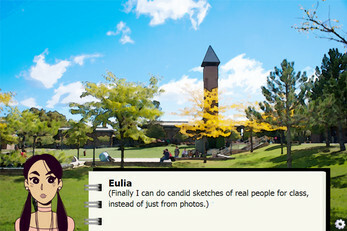 Eulia is a college freshman who was just looking to do some drawing for class outside. Until she meets star soccer player Mel, and can't stop thinking about her. 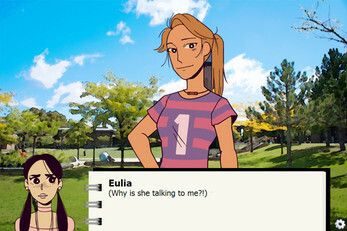 Will Eulia have enough confidence ask Mel to hang out with her? Does Mel even like her? Or would Mel want to spend time with her? 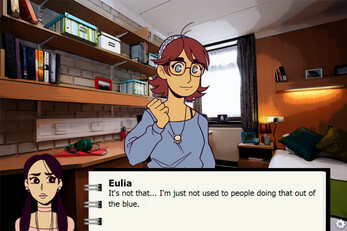 Try and guide Eulia through the story how you see fit. The choices you make affect the confidences of the characters, and that will change how the story ends. Will this be the earliest spark of a relationship, or will they simply be two ships passing in the night?